*See photos above by clicking the > on the right side in the center of the image. Carolina Herrera celebrated her 35th anniversary in fashion with an array of signature elements presented during her spring 2017 New York Fashion Week show. Black and white ensembles had slim silhouettes. Denim was done up in voluminous ball gowns. Gorgeous gingham dresses added a playful element to the show. 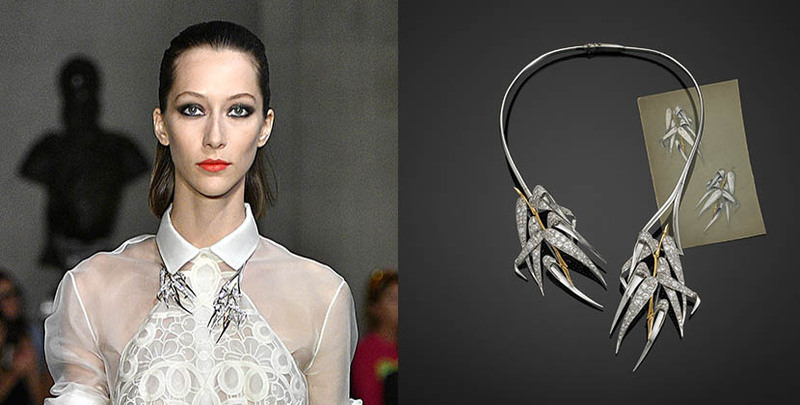 Herrera infused the collection with a celebratory quality by styling a number of looks in jewelry from the super chic Suzanne Belperron boutique in New York. There were one-of-a-kind vintage jewels featured in the best selling Belperron book and modern pieces made to the celebrated French designer’s specifications from drawings in the archive. See several of the looks in the slide show above Get the details on the designs below. 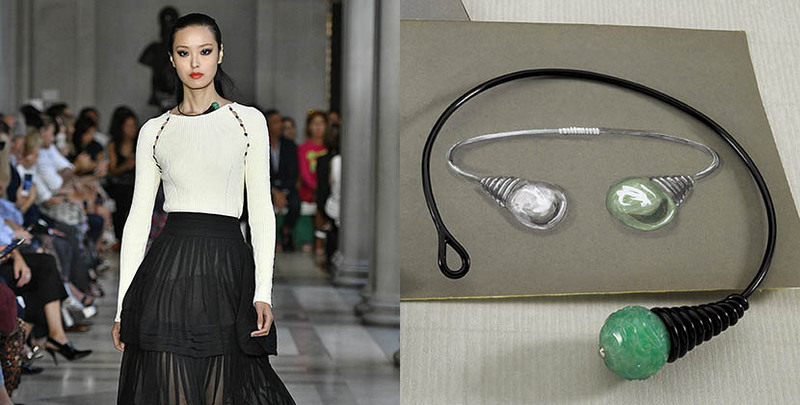 The black lacquer, diamond, platinum and gold Toggle Torque necklace, paired with a Carolina Herrera off the shoulder black and white dress, was originally designed by Belperron around 1933. Surrealist fashion designer Elsa Schiaparelli, a major Belperron client, had a rendition and modeled it in Vogue shortly after it was originally created. 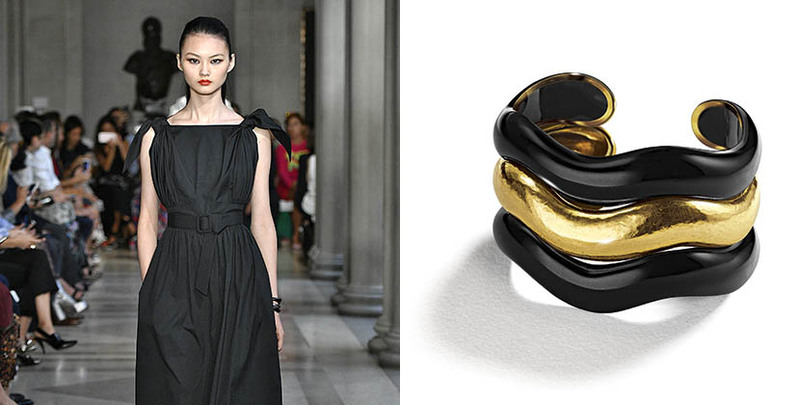 Several of Belperron’s signature wave bracelets appeared on models in the Carolina Herrera show. A gold and black jade rendition of the design was worn with a black dress. The vintage Bamboo Belperron necklace, worn by a Carolina Herrera model with a white shirtdress evening gown, was created during the early 1940s. The two clusters of diamond, platinum and gold bamboo leaves at the ends of the open necklace can be removed and worn as brooches. 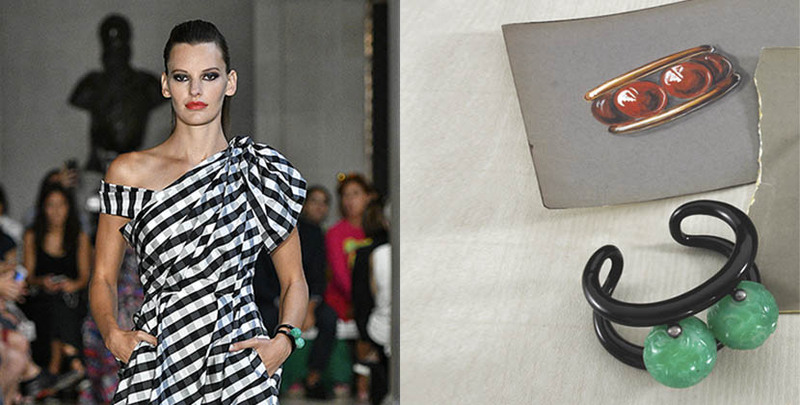 The large green glass beads in the vintage Abacus black lacquer double band cuff from Suzanne Belperron’s personal collection of jewelry popped against a gingham dress worn by a Carolina Herrera model. 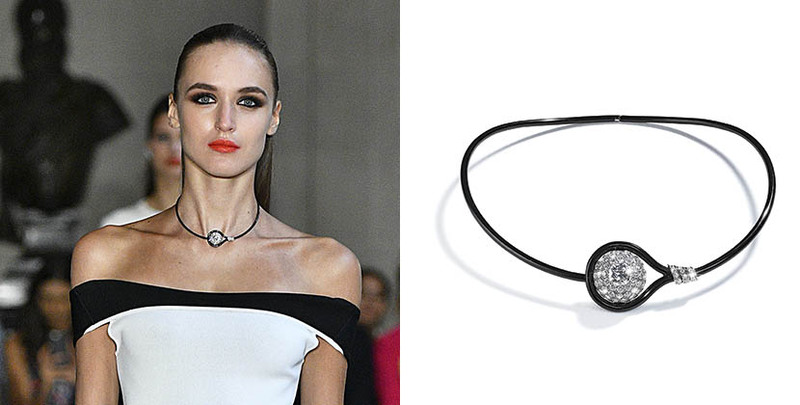 Another model in a white top wore the matching piece from the jewelry designer’s demi-parure—a torque necklace ending in a coil and one large glass bead. One of the most surprising pieces of vintage Belperron to appear at the fashion show was a vintage turquoise and black lacquer armband worn by a Carolina Herrera model with a black one shoulder gown. 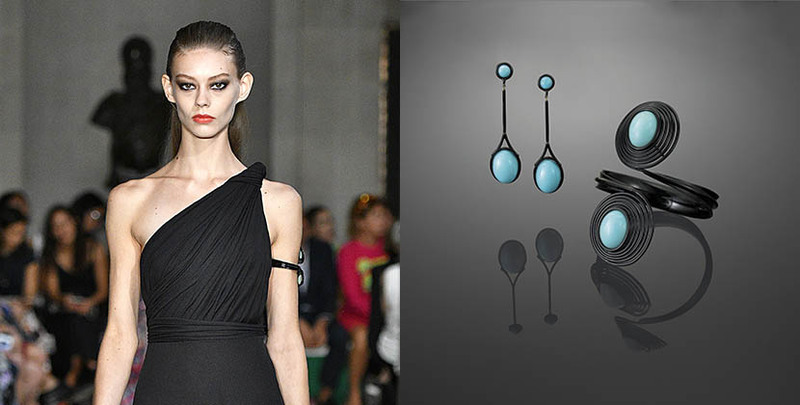 The jewel created in 1928 features two big cabochon turquoises wrapped up in black lacquer and silver metal.